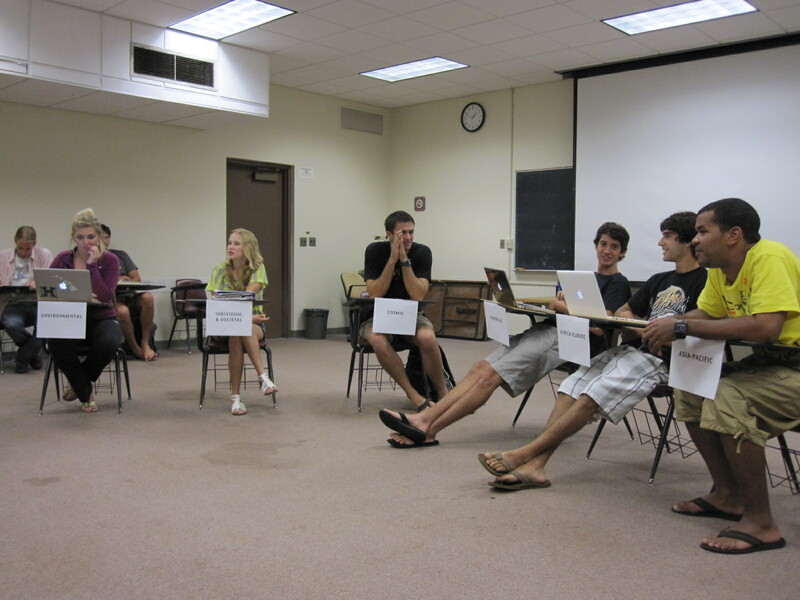 3×3 Global Drills being run in an undergraduate political science course, Global Politics/International Relations at the University of Hawaii at Manoa, Spring 2012. Preventing human extinction by modeling synergistic global power. The drills process optimizes the traditional Case and Harkness methods of inquiry through pan-disciplinary collaboration. Serendipity by design as part of this process can enable six people or less at a time to generate new ideas while alternating teams of six observe different approaches to global mega-threats from their own, each in 45-minute periods of deliberation. Experimentation with the 3×3 Global Drills process is encouraged by organizations worldwide. The operating principle for 3×3 Global Drills is reflective intensity, as found in war room settings but antithetical to war itself. It is suggested that drills participants in an organizational context can learn from their mistakes through 15-minute debriefings, followed by individual writing of nine-part strategies. The content and number of drills can be customized based on size and complexity of organizations.